Release » Brewology - PS3 PSP WII XBOX - Homebrew News, Saved Games, Downloads, and More! Android Ice Cream Sandwich coming in October??? With the iPhone 5 strongly rumored to drop in either September or October, it seems as though Google has loaded up their cannons to return fire at Apple with their highly anticipated Android 4.0 update, dubbed “Ice Cream Sandwich.” First announced at Google I/O 2011, there is still a great deal of mystery surrounding the next version of Android, but thanks to reports from multiple sources, we have learned that it should be showing up on devices in October. We say devices, rather than phones, because Ice Cream Sandwich will not be a phone-exclusive platform; we’ll be seeing Ice Cream Sandwich on phones, tablets, computers… who knows where else. Redmond Pie reported on a source who, according to them, has knowledge of Google’s Ice Cream Sandwich plans. The source statesthatthe first device, which may be either a smart phone or a tablet, will be released in October (earlier than planned) to compete with Apple’s next-generation iPhone which is strongly expected to release either in September or October. USB Hosting It is understood that Android 4.0 will bring about USB Hosting which will allow you to use practically any device with the tablet ranging from an Xbox controller for games to a keyboard/mouse for surfing and other things. You will also have the ability to integrate a USB device to work specifically with an app. So a heart monitor used with a fitness app, for example. Tracks Your Face Android 4.0 wil have the ability to track your face so instead of you trying to move around to get into the camera, the camera will auto-focus on to you instead. It will also be handy in video conferencing because the camera will moveto you when you begin speaking and then move to whoever speaks so you don’t waste time trying to move your phone or tablet every time the you want to focus it on someone in particular. 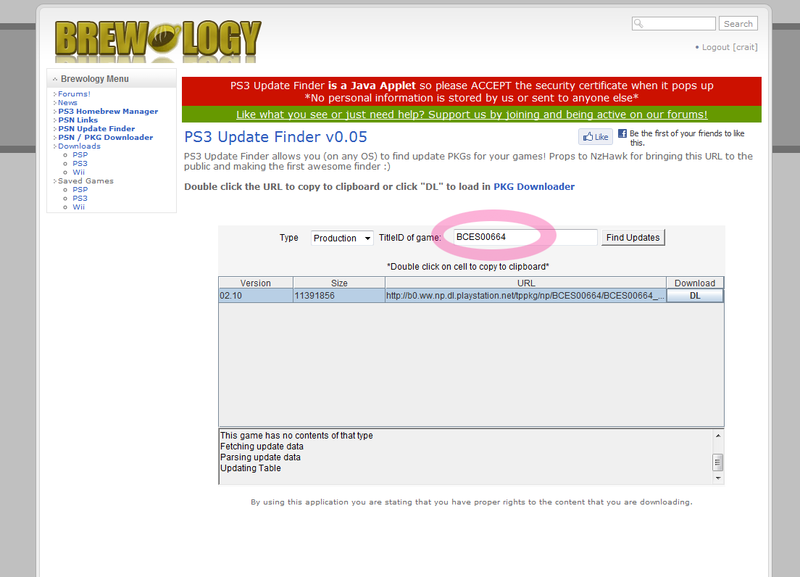 Nik (also known as MonkeyMaximus) has just released the third Java Applet in the PS3 Homebrew Suite on Brewology.com/ called the PS3 Update Finder!! It goes perfectly with the previously released tools to download homebrew straight to your PS3 from the internet and to download PSN content without the need to log into the PSN!! It was only a little while ago that the homebrew manager was released to save people much time. No longer did they have to get their homebrew from online sources from all over and install them onto their computers, and then FTP them over to the PS3. The site does it automatically. And guess what! It’s very, very secure! We store no personal information on our sites, whatsoever! What exactly does this new Applet do? Well, it’s an Update Finder that is based in Java so it isn’t limited to solely the Windows OS. All you have to do is enter your Game ID for the game you want to search for, and a list of updates and patches will be returned that you can easily cue up to be downloaded all at once. That simple. Come check out the new Java-Based Applet over at Brewology.com/ today! Note: Nothing on this site is illegal content and is very secure. We do not log your information you put in. And it’s free! Earlier today, in France, Blizzard stated in a press release that World of Warcraft’s newest expansion named Cataclysm will be released on December 7th for both Windows and Mac systems at $50 as a digital download or DVD-ROM. A Collector’s Edition will be sold with bonus items for ~$100 at the same time. Both of the latest expansions The Burning Crusade and Wrath of the Lich King had record breaking sales. I’m sure Cataclysm will sell just as well.